Essential plot rundown: My name is Jake. I can't tell you my last name or where I live. It's too dangerous. The earth is being invaded. Being invaded by parasitic aliens called Yeerks that crawl into your ear and take control of your brain, leaving you helpless. But we fight. We were given the ability to morph into any animal we touch by a dying Andalite prince. We use this power to fight the Yeerks until the Andalite fleet can come. But, until then, we are alone. And that is essentially how every book in the series starts: The character introduces them self and describes the situation. 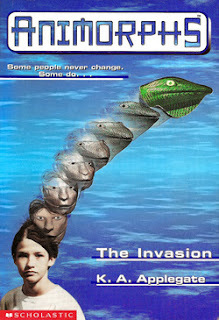 I started reading this series when I was in the 5th or 6th grade, but for some reason I stopped about halfway through. Then last summer I had the desire to finish the series. So I bought the rest of the books off of eBay read the whole thing. Despite being 25 years old and this series being aimed at elementary aged kids, I really enjoyed it. I don't know how much of that enjoyment came from actually liking the books or from nostalgia. The story is really good, but the writing isn't that great. (But I don't know if that's because the author isn't that good or because I'm 15 years older than the intended audience). For being a children's series, I was kind of surprised of the topics that are treated. It covers war, morality, freedom, dehumanizing, necessary evil and other things. In one book, one of the characters gets stranded with a Controller (a human being controlled by a Yeerk). Here, we get to see the point of view of the "enemy" and get to understand the motives of some, but not all, of the Yeerks. In another book, another character must decide between protecting his family and saving the entire human race. There are just a lot of deep issues that are treated here. But, like I said before, the writing isn't very good. A lot of things are unnecessarily repeated throughout the series. And the author describes things the same way all the time. So, some parts got repetitive and I ended skimming over those. The characters are not too complicated. Each one has his or her personality (Jake is the leader, Marco is the funny guy) and his or her challenges they must face (Rachel gets too involved in the war, Ax is completely alone on an alien planet). But, because there are multiple characters this simplicity works out, with the characters providing checks and balances to each other. They often argue on different subjects, creating some drama. (The good kind of drama, not the high school kind). There are about 60 books in the series. And about half of them contribute to the overall story by either adding new characters or developing those that are already there. The other half are just "missions" that the group goes on in order to stop one Yeerk scheme or another, but add nothing of significance to the story. Now, I'm going to talk about how the series end. So, if you care there will be spoilers ahead. If you don't, thats cool too. *Spoilers* I had mixed feelings about how the series ended. And there were a few loose ends that could have easily been fixed. Let's start with those. Towards the end, Jake's family gets infested by the Yeerks. We know nothing of their fate until the last book, where they are briefly mentioned as having Jake living with them. The whole time I was wondering if they were dead or what happened to them. I really wanted a scene where Jake rescues his parents and they ask about Tom and Rachel. (More about that in a moment). That could have easily been a powerful scene that hearkens back to the series' themes of war and family. But, no, we get nothing. I also wanted to know what happened to Loren, Tobias' mother. She supposedly left him when he was a kid but they are reunited at the end. After the war, Tobias disappears and goes into solitude. The whole time I wanted to know what happened to his mother. Does she go looking for him? Does she know where he is at? And what about Marco's stepmom? What happened to her? Also, about a thousand Taxxons defect and want to help the Animorphs in exchange for refuge after the war. After the war they get their refuge, but they don't do anything to really help. 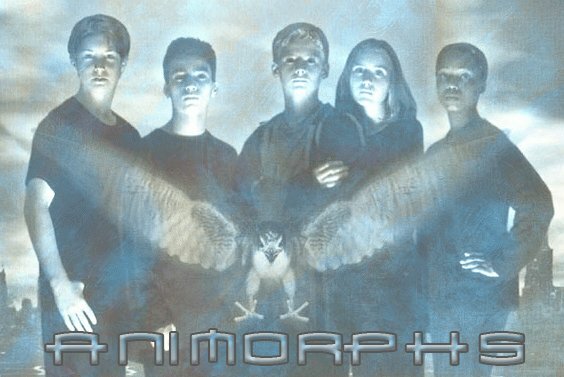 I was expecting them to let the Animorphs on board the mother ship and then swarm it themselves. But, no, they don't do anything until they get their asylum. But those are small things of little consequence. However, there were a few things that really bothered me. And apparently, how the series ended bothered a lot of people because the author, KA Applegate, wrote a LETTER explaining why she wrote it that why. One complaint I had was what happened between Ax and Visser Three/One. The Visser killed Ax's older brother, Elfangor, and Ax must avenge his death as part of their culture. Ax and the Visser fight each other a couple of times throughout the series. I was expecting this to foreshadow their final battle and Ax avenging his brother. But, at the end, the Visser just gives up (which is totally out of character) and there is no dramatic fight. Instead, the Visser is prosecuted as a war criminal. I felt robbed. I wanted Ax to avenger his brother. At least fight him into submission, if not to the death. I also had mixed feelings about Rachel's death. Jake sends Rachel (his cousin) to kill Tom (his brother who had been infested since the beginning). Rachel ends up killing Tom and is badly injured. She then demorphs, which heals her wounds, and then is killed with a single blow as she sits helplessly on the floor. I have no problem with Rachel being killed. It seemed inevitable with her character; she was ruthless and always wanting to fight. That was a natural progression to the story. I just didn't like how she went out: helpless. I really wanted to see her go down fighting. But, overall, Animorphs was a really good series. I'm glad that I finally got to finished it. And as soon as I finished it, I kind of wanted to start over again. I'm looking forward sharing these stories with my kids in the future.